Seventy-five percent of people say Pinterest is the best place to find new interests and 67 percent say it’s the place they come to express creativity according to a study from Ipsos. Because of this, Pinterest has unveiled a new Rich Pin format dubbed how-to Pins. This type of Pin displays a snapshot of the steps required to create the objective of the Pin (e.g. How to Make Easy, Cheesy Pizza Pull-Apart Bread) right below the Pin image. What’s more, users can click or tap on any of the steps to get the full instructions and a list of supplies without leaving Pinterest. 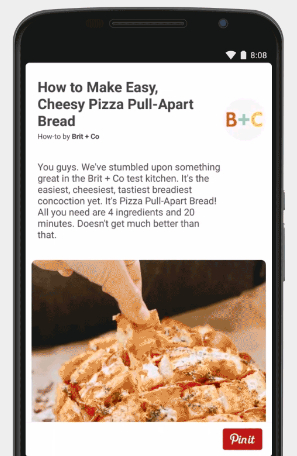 How-to Pins will start appearing from early adopters this week, which includes brands like Brit & Co, Greatist, Food.com and The Home Depot. That said, this type of Pin will only be available on Android and the Web at first, with iOS being rolled out later. Those that are interested in turning their Pins into how-to Pins can fill out a form here.